I needed more than a week to recover and digest what I had learned at the September 27 European Day of Languages. The European Day of Languages is an annual worldwide celebration, launched in 2001. This year the Toronto celebration was held at the Spanish Centre (last year was at the Instituto Italiano di Cultura; Toronto schools take turns hosting each year). After getting in the mood with red wine and appetizers, participants could then have a taste of 30-minute classes in French, Spanish, Portuguese, Estonian, German, Greek, Polish, Italian, Hungarian and Lithuanian. Before the classes, participants received a ‘European Languages passport’, and received stickers for each class they attended. Attending 3 classes allowed one to take the super-fun ‘language dating class’. Pat tried the German and Polish classes, but I decided to challenge myself with Portuguese, Hungarian, Italian and Estonian! I started with Estonian: Merli and Lisa taught us greetings, days of the week and verbs (to speak is raagi and to study opi). Estonian is not an Indo-European language, but comes from the Uralic family. Estonian only has 4 vowels: ä, ö, ü, õ. There are 700,000 Estonian speakers living outside Estonia. In fact it is possible to take Estonian classes in Toronto at the Estonian House. Merli (in Estonian folk costume) and Liisa, my two Estonian teachers. aitäh! Thank you! After Estonian, I rushed to Portuguese class. This was one of the most popular of the European Day of Languages: the line-up was endless, but I managed to sneak in. I know that’s not good Canadian behaviour but it’s how we do it in Paris! It was weird because Portuguese is similar to Spanish, so I pronounced almost all my Portuguese words in the Spanish way. I have noticed that Portuguese is really a noisy language. Thus, when I travel to Brazil I’ll speak Spanish with a noisy sound—it might work! The Italian class was my third choice. My teacher from the Instituto Italiano di Cultura was really ‘vivace‘ and had a vibrant way of communicating. It was easier and less confusing for me to follow Italian compared to Portuguese. Like in Spanish, Italian pronouns are rarely pronounced. People say sono di Toronto, I’m from Toronto (literally, “am from Toronto”) rather than Io (I) sono di Toronto. To understand Italian and Portuguese, Spanish is definitely a bonus. After testing two common European languages, I decided to challenge myself and learn more about Hungary and Hungarian. What I learned? Hungary is famous for its wine. Palatschinke (Hungarian dessert) is similar to French crêpes. The Hungarian alphabet has 44 letters (many are similar in form and sound to French). The hardest thing for me to pronounce was Elnezest, hol van (legkozelebbi) bank automata? which means “Excuse me, where is the nearest bank machine?” My advice: Make sure to carry enough money before visiting Hungary! We finished the night with music from a Cuban band, salsa casino dancing and Cuban rhythm—La noche fue muy caliente! 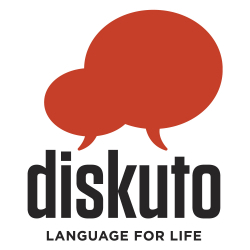 Like Diskuto, the European Day of Languages was the right place for language lovers like me. Another place where you are not ‘bizarre’ for speaking many languages but where multi-linguists and polyglots share their passion for languages. Khady recently arrived to Toronto from Paris. She lived in several countries such as China, Mexico and Spain. Because of her many travels, she speaks fluently three languages: French, Spanish and English. She hopes to brush up her Mandarin in Toronto. When she’s not learning different languages, she likes to cook and play guitar. She is the Digital Marketing Coordinator at Diskuto.